TeamGroup recently released a new line of flash drives which offer security, fast transfer speeds, excellent performance in read / write speeds and the design is based on a shield to appease the customers. The USB has been welcomed with much praise and has even received a prestigious 5 stars from the Italian company NextHardware. Adopting a tough appearance and shield design as the core product theme, C101, a high speed flash disk from Team Group, is positioned to securely transfer, store and transport personal data for users. After stringent tests and reviews on its performance and access speed (both writing and reading speed), Nexthardware, a computer media company in Italy, has given C101 five stars, the most prestigious level for computer hardware. C101 uses an USB2.0 interface and can transfer data at 480Mbps (actual data accessing speed can reach 20MB per second and writing speed 10MB per second.) It comes with five capacity choices from 2-32 GB to satisfy the demands of different consumer segments. C101 also supports an automatic power saving mode that can significantly alleviate load on the laptop battery and effectively prolong battery life. 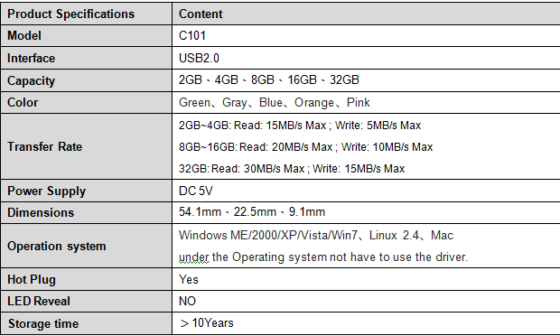 According to Nexthardware, C101 is a multifunctional flash disk suitable for all kinds of applications. C101 not only offers excellent access performance to greatly shorten download times, but it is also competitive in price. In addition to product reviews and introductions of both hardware and software, Nexthardware, the most respected Italian computer peripheral media company, offers complete pricing information and information about the latest market developments. It is one of the most trusted computer media companies in Italy. About Team Group:Team Group Inc. is a manufacturer of computer products and consumer electronics, established in Taipei, Taiwan in 1997. We manufacture and distribute high quality Memory modules, Memory cards, USB disk, SSD, and Portable Hard Drives. Team Group is recognized as one of the leading memory products and consumer electronic manufacturers in the industry. We cover most business regions in the world. Team provides the highest quality products to customers in volume with competitive prices and the best possible after services. Through many years of the close and direct relationships with the leading manufacturers and OEMs, we are able to provide various products even during the shortage and allocation periods. As we continue to grow, we are committed to supporting our customers with superior products, first class service and excellent business growth.